My eggplant plants are out of control. 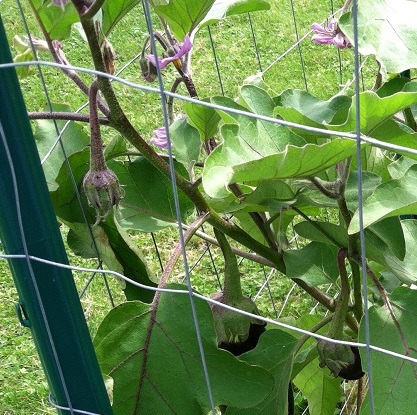 (I feel like that’s not the right way to say it – should it just be “My eggplants are out of control.”?) They bloomed late and then grew just one at a time. But now, they are all growing and I’m going to have eggplants coming out of my ears! As you know, I like roasted eggplant with tomatoes and Beekman 1802 Blaak Drizzle (Click there to get some. You really should. It. Is. So. Good. You can have it on salad or cheese or even on vanilla ice cream. Plus, I just love all the Beekman stuff! End of commercial.) But there is only so much eggplant I can eat immediately. I also like eggplant parm, which I will make and freeze. But what else is there? Who has a good eggplant recipe that will freeze well? How about a knitting update? I’ve been working hard on my Ecuador (click there for the official pattern pics) sweater so you will have an idea of how it is constructed. It is very unique. I’ve pinned it out onto a towel and stretched it out as best I could to show you. It will be bigger when is it soaked and pinned out after I’m done knitting. Ok, what you are looking at is the upper back (the rectangular piece to the left of the oval hole), the left front (below the rectangular piece, with the straight edge) and left side (to the right and below the oval hole). The oval hole is the left armhole, where a sleeve will go later. Can you see the little orange marker sticking in the rectangular piece? Going in a line over to the right and getting to the armhole — that will sit on top of my shoulder. I am now getting to the part where I will be knitting the lower back, which I will be doing counterclockwise around the rest of the rectangle, joining to the rectangle edge every 2 out of 3 rows, then leaving another hole on the right for the right armhole. The little pie sections where the stripes look slanted are short row sections that will give the sweater some swing and drape. Can you picture it???? P.S. If you would like to subscribe to this blog, you can go to the comments section (next to the blog title) to sign up! P.P.S. I also added a Facebook sharing button in case you want to share! Posted in Uncategorized on September 24, 2013 by lizytish.